New and improved Green Beaver deodorants contain a revolutionary organic sage oil isolate which is effective at killing existing odour, as well as preventing body odour. They also contain soothing Labrador Tea which combats irritation caused by shaving. My job involves driving and sitting at a desk doing computer work. It's not stressful or physicially demanding and I've never have a problem with BO or sweat, even when I've forgotten to put on deordorant in the morning...until I tried this product. I stink by the end of the day!! Spend your money elsewhere! Great product. It is virtually scent free and so far offers 24 hour protection prior to the arrival of summer. I needed a spry on as the roll on products irritate my skin and this product delivers. Works great for me, even when running around and stuff. I love Green beaver products, so I bought this deodorant for my husband. Unfortunately, he wasn't very keen on the smell and felt like it wasn't very effective for him. 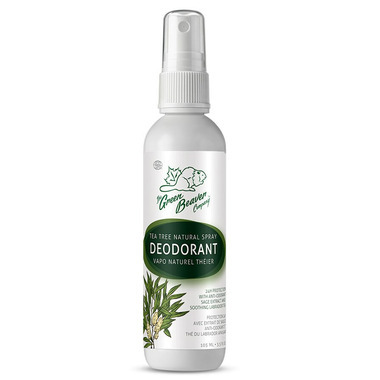 I tried the Green Beaver spray deodorant when I was too lazy to use the stick and absolutely loved it. It takes a few moments to dry but it works so well; smells wonderful. This stuff smells very nice and works so-so on me. I'm going to stick with my normal Aubrey's Men's Stock deodorant since it lasts through the workday, but I would recommend this for someone who sweats a bit less. This is a great spray, it's Canadian and at a few bucks cheaper than Weleda I'm a fan. The tea tree smell mellows after a few minutes but it keeps me smelling good throughout the day. I do put Green Beaver stick deodorant on after the spray dries and its a general win. I've been using natural products for years now and this was a really nice surprise. Dual endorsement for the Green Beaver Vetiver stick deodorant - with the Tea Tree it has this super woodsy herbaceous fragrance and its just killer. The only thing to remember is that this isn't some invention of modern science. This will last about 8 hours without reapplication but it does wear off. This doesn't bother me because I'm not a fan of industrial chemicals but its something to be aware of. Otherwise great product and I hope more people try it so they keep making it!